Here are some FAQ that may help you determine whether you should engage with Lydia's Marketing as an independent outsource partner. Are you a full-service marketing agency? No, I am an independent marketing and communications consultant. I can help with general B2B marketing consulting and brand & communications strategy, and can help guide the implementation as makes sense. For more information on when I am or am not a good fit, read ‘Dear Marketing Consultant: What Services Do You Offer?’. My home base is the San Francisco area. I can work on-site in San Francisco or Marin County otherwise I mostly serve clients virtually. If I’m in Minneapolis and you’re in the San Francisco area, how will we work together? 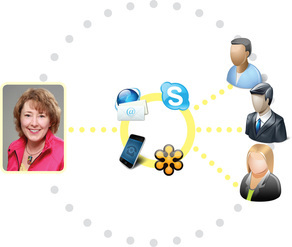 Most of the services I provide can be managed remotely with phone/email, Skype, Webex and Basecamp or Google Drive. If the scope of your work requires significant face time (e.g. to lead your marketing team temporarily or to interact regularly with your staff), I am available to travel to the client site for an extra fee. Virtual resources are not for everyone and do not make sense for some assignments — if my value proposition appeals to you, we can talk it through to see if the virtual option can work. I need someone to build my website and manage SEO/SEM; can you help with that? I can help coordinate and oversee that work with subcontractors or an agency partner if you need someone who knows what they’re doing to guide the ship. If not, this is a good example of where you may want to hire a specialist directly. My value is general guidance, organization and oversight of your marketing and communications strategy and plan. I offer consulting in the more traditional sense, although I can also do tactical work such as create content that requires strong business acumen (e.g. case studies, sales or executive presentations, explainer videos, etc.). This video may be useful. 1-minute overview of my services and how I can help. You offer many marketing services; what’s your favorite? My favorite assignment is to help a new or growing company figure out their Brand Strategy, i.e. what they stand for; how they want to be perceived; who they are; their unique value; their voice; their look; their message. Who is NOT a good fit for you as a client? If you are an “idea” person, know exactly what you want for your Marketing and simply need a person to execute, I’m probably not the best resource for you. I am a B2B marketing strategist and consultant, so when you already know what you want it’s often better to hire a general contractor or specialist who can “take an order” and implement it according to your specifications. It depends on the scope-of-work, but you could expect to pay between $75-$95 per hour. My speed and focus on the practicalities separate me from the rest, so you can be sure I will reduce unnecessary processes and documentation that slow things down. By cutting to the chase and focusing on what’s most valuable to the outcome you will be able to keep consulting costs down and get a good return of investment. How do I know if you are charging a fair amount? I am extremely transparent about my marketing consulting fees and keep a log of everything I spend time on so you know exactly where your money is going. Having spent years hiring outsource partners I know what you want to know, therefore transparency and “keeping it real” are a huge part of my value proposition. Can you give more detail on your Marketing Coach offer? My experience is that much of the marketing work that needs to get done doesn’t because decision makers: a) can’t make up their mind, b) are not convinced of the value or are not quite sure what to do, or c) do not give clear direction or proper guidance and support to worker bees as things get moving. As a marketing coach I can be available on demand and as needed for burning questions, to help flush out an idea or break down a barrier by simply talking and emailing. Having a thought-partner on call may help crystallize concepts quicker and accelerate decision-making and execution, and therefore produce results and ROI. I’ve hired marketing consultants before, and it seems all they do is charge a lot of money to produce a lot of documentation. Why should I consider you? Check out these 36 testimonials about my work and style for some good reasons to consider me. It’s true, many consultants are expensive and may include too much processes or extraneous activities in their scope of work that ultimately do not translate to action. Much of what you’re often paying for are robust charts and documentation and the time it takes a consultant to put it all together. Having been on the receiving end of that consultation, I’ve found that the problem is usually that the business that hires the consultant is not ready or committed to the implementation of the output. Most of the consultants I’ve worked with offered great value, but much of it was not realized because the client did not act. This tells me that many businesses that hire consultants are not ready to “receive” the information, and should therefore focus on bite-sized areas they can successfully execute. One of the reasons I became a consultant was because of this gap and the need for a middle ground. This press release from my launch helps shed light on how I’m different: A Different Approach to Independent Marketing Consulting. What is the scope of your Content & Communications offer? Strategic content is critical if you want to get leads from your website, enable sales teams, build customer loyalty and engage employees. I can give you a strategy, guidance and structure that ensures ROI. I am also a good storyteller and project leader and can create narrative content that conveys your value proposition in an interesting way- e.g. case studies, customer-facing or executive presentations, explainer videos, etc.. Read ‘4 Ways A Content Consultant Can Help‘ for more insight. I can also help with Internal Communications. What is the scope of your Social Media offer? I consider social media in two buckets: 1) as part of the marketing planning, to determine how/if/when it fits as a lever to drive business, and getting it set up or “kick-started”; and 2) as part of the content management workload, i.e. day-to-day management of social media activity. I can help with both, but I consider determining the role and opportunity of social media different from managing an active social media plan. Visit the Services section for details of my offering. The Who I Serve section may also be helpful. I need help figuring out my Brand and Messaging Strategy but don’t have the patience for long drawn-out research and processes, nor do I have the budget for that. Can you still help? Yes, as a marketing consultant my specialty is to apply proven methodologies and processes used by the big brands to get to “the story”. I streamline them so that you get effective results at a fraction of the cost. Download my brochure to see a general example of what you can expect. Or visit this blog post for more context. Do you help with execution and can you confirm what you don’t do? When it comes time to execute your plan, I can provide coaching or temporary leadership to oversee the work with specialists on your team or an agency partner. I can also help with writing and content development and in some cases, I can hire my own team of virtual freelancers to help with implementation. I can also give consultation on how to organize and manage your staffing model (for both in-house and outsourced talent) so you get the best bang for your buck. Brand strategy that involves: In-depth offsites with company leaders; comprehensive and expensive industry, customer and competitive research; and extensive testing, synthesis and deep analysis — The reason is: 1) I work mostly virtually and 2) I believe this level of brand strategy requires expertise and resources from agencies or consultants who specialize in brand strategy. Website design: My sweet spots are content strategy and goals for the website as a channel, not the design. However, I can oversee design subcontractors as part of a broader website project should you need someone to guide the ship. SEO/SEM all day every day: I am very familiar with disciplines, trends and best practices and can advise on SEO/SEM’s role within a marketing plan. However, if your business relies solely on SEO/SEM for growth, I’d suggest hiring someone who does this work every day, all day — it requires a lot of expertise and TLC. Ridiculously fabulous ad, tagline and headline copy: Superior short, eye-catching, wow-them copy requires a special talent. When I want to knock this out of the park I like to recruit help, and focus my time on the “story” and core messaging. In fact I wrote a blog post a while back on this very thing. Data mining and detailed data infrastructure: I can develop a reporting infrastructure strategy and determine metric goals to achieve desired results, but I am not a database manager or data analyst. Highly sophisticated lead generation and nurturing machines: I can be a consultant to oversee and guide this work but am not resourced to implement a large investment end-to-end. There are many good full-service agencies and consultants that do nothing but this.